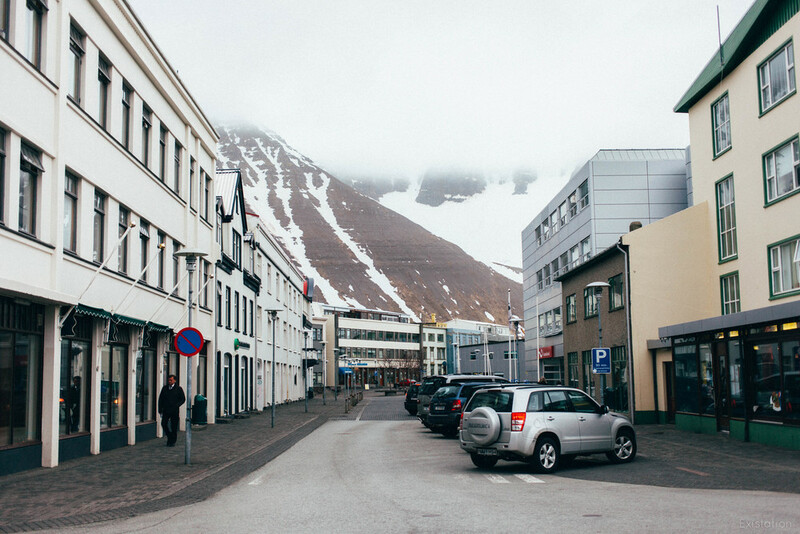 The name Ísafjörður looks fake, like it should be in a fantasy novel or something, doesn't it? Icelandic is a crazeballs language, one that I would consider trying to learn just for the challenge of it; after spending a week in the country, I gained a tiny grasp of a few suffixes, such as "foss" (waterfall), "stræti" (street), and vík (bay), although the pronunciations of most of the words I became visually familiar with still escape me. Ísafjörður means "ice fjord" (in Icelandic, they spell their country's name as "Ísland" - ice/ís...see? It's allll connected). 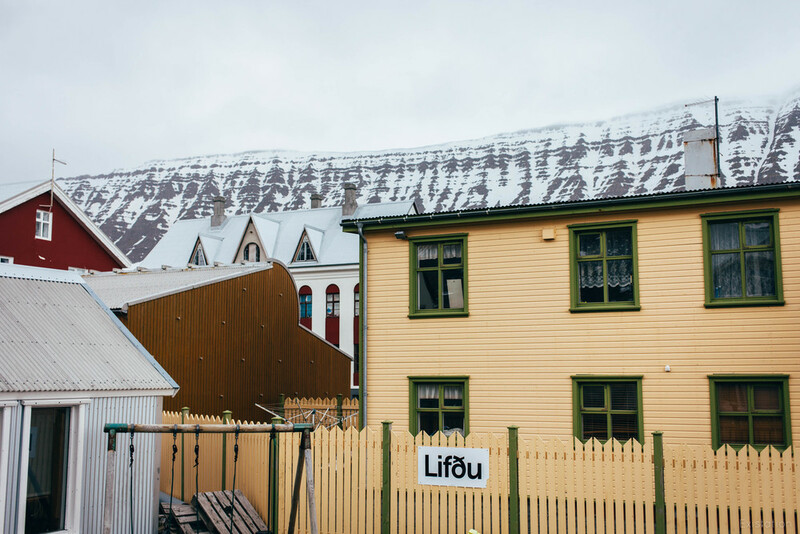 It's a small fishing town located way up in the nether regions of the Westfjords, and it is indeed surrounded by ice and fjords, just like its name suggests. When I visit a new place, my mind crafts a life for myself there. 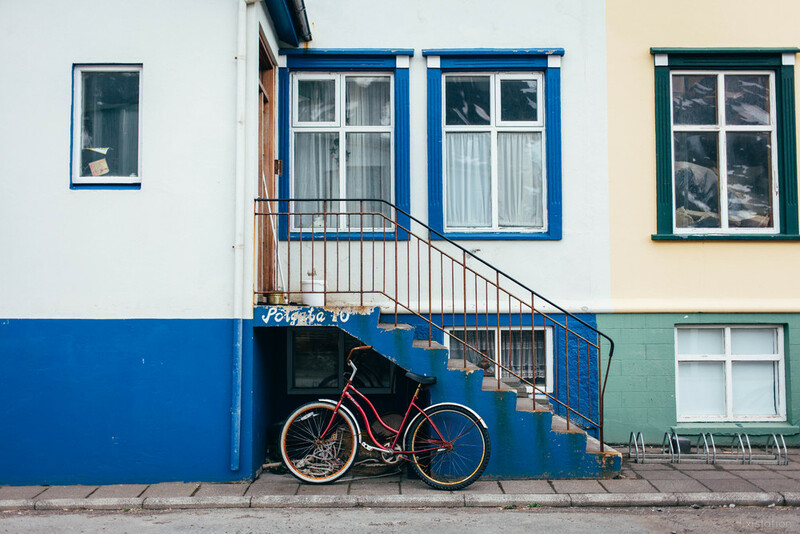 As a result, I've mentally lived in dozens of towns across the globe, my existence constructed out of the way the air smells, the people who would be my neighbors, and the ambiance of city streets; how easy it is to walk from Point A to Point B, the coziness factor of the houses, etc. Ísafjörður was a tough nut for my brain to crack, because the weather was gloomy and the buildings were constructed out of corrugated metal and concrete, but inside, the living spaces were warm and smelled like baked goods, and there were towering cliffs in the background, and it was still early spring, after all; I had seen pictures of summertime, during which the whole area transforms into a green, lush paradise. It was hard to imagine. Mostly, it felt very empty. 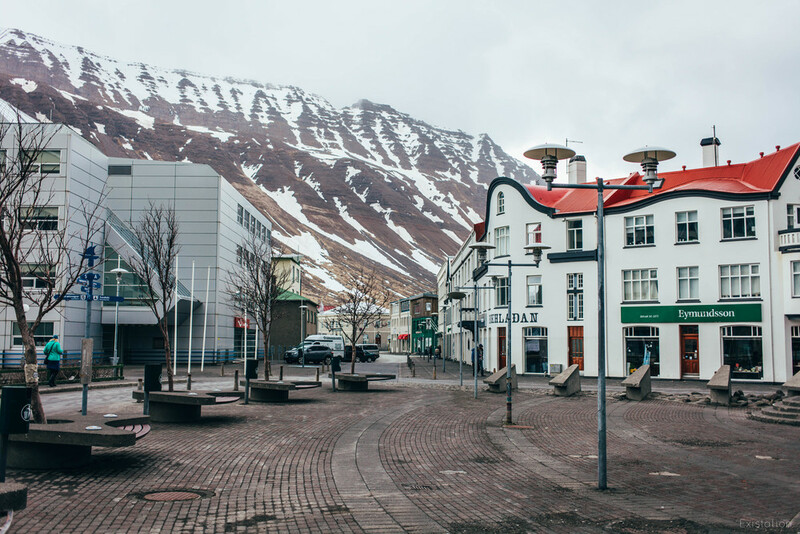 This turned out to be the case for the vast majority of Iceland, where people are sparse and wilderness presides as king, but I couldn't help but wonder what daily life felt like for the citizens of Ísafjörður. In our two days there, we ended up seeing a few of the same people multiple times. The biggest crowd I saw was a group of people leaving either a funeral or a church service. But the places that served food and drinks were often bustling, lit with glowing yellow light and playing American pop music softly in the background. The original plan for our time in Ísafjörður was to go kayaking to the island of Vigur, which is apparently a paradise for puffins and other birds of the North Atlantic, but true to Icelandic tradition, the weather on the day of our trip was too windy for us to be able to safely paddle out and back. So instead, Elena and I caught up on some much-needed sleep, wandered the streets of town, and went for a drive along a road named Súgandafjarðarvegur and through a creepy, miles-long tunnel hollowed into one of the mountainsides to visit the tiny village of Suðureyri for dinner. On the other side of the mountains, it was wild and stormy, sheets of ice, snow, and rain floating over the water, with the sun occasionally bursting through the clouds to add an ethereal glow to the whole scene. Whenever I got out of the car to take a picture, the wind slammed me sideways, and I had to walk against it, laughing at how absurd I must look, and hold the camera as steady as possible to get my shot. There was no one out in Suðureyri, and the weather was so miserable that I couldn't even bring myself to use my camera; I had heard of a little restaurant attached to a place named the Fishermen Hotel, and we aimlessly drove around for awhile until we spotted human life through a window, which turned out to be just the place we were looking for. We allowed ourselves a nice, slow meal before heading back out into the dusk, where a real snowstorm was brewing. We were happy to get back to our creepy tunnel and then our nice, warm beds. Can you spot the entrance to the tunnel waaaay at the top of the hill? 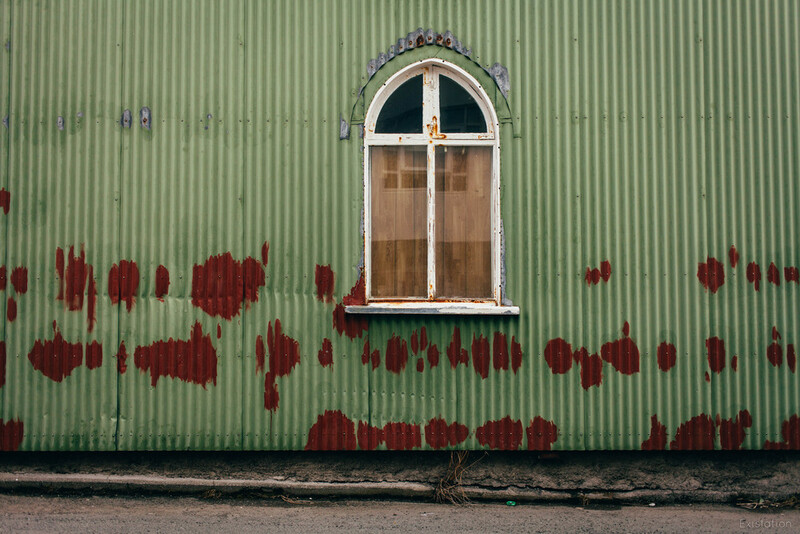 Next up: our journey back from the Westfjords and some Reykjavík love.